What brought the Doomsday Clock so close to midnight? We’re two minutes from midnight. The Bulletin of Atomic Scientists has set the Doomsday Clock, the ubiquitous marker of how close humanity is to a civilization-threatening catastrophe, at two minutes to midnight. That’s the closest we’ve been to the apocalypse since the height of the Cold War. As some sobering perspective, the last time the Bulletin moved the clock to two minutes, the U.S. and Soviet Union had both just tested their first hydrogen bombs. The clock stayed there, unmoving, until 1960, when the Bulletin moved it back in reaction to increased dialogue between the two nuclear superpowers. This is all to say that we haven’t been this close to doomsday since the days when duck & cover wasn’t a quant relic of the past and sci-fi morality tales about mutants and aliens were the preferred way to warn of the dangers posed by nuclear weapons. So, what brought us to the brink of midnight? The Bulletin chalks it up to a number of things, from climate change, to the threat of cyber warfare, to the malicious spread of misinformation. But one factor jumps out as singularly threatening: nuclear-armed world leaders. Tensions on the Korean peninsula, nuclear build-ups on the Indian subcontinent, and threats to critical international nonproliferation agreements are all cited as reasons for the Clock’s move in a report by the Bulletin. Digging into these reasons, it becomes clear that the actions of a few leaders (elected or otherwise) have a horrifyingly outsized role to play in increasing the chance that humans bring about their own end. Looking to the U.S., the actions of President Donald Trump are highlighted as particularly threatening. A copy of his administration’s Nuclear Posture Review (the document laying out the role of nuclear weapons in U.S. policy) leaked shortly before the clock moved closer to midnight. The Bulletin notes that the document seeks “to increase the types and roles of nuclear weapons in U.S. defense plans and lower the threshold to nuclear use.” Which is to say the Trump administration wants to make nuclear war easier to wage. President Trump also displays an outsized animosity towards the Iran Deal, an international agreement that has put a verifiable halt on any nuclear weapons aspirations Iran has. Threats to both the Iran Deal and Intermediate-range Nuclear Forces Treaty, which eliminates an entire class of particularly dangerous nuclear weapons from the U.S. and Russian arsenals, signal an unwillingness to choose stability over power and mark a potentially catastrophic break with historic presidence. When talking about how potentially close the world is to the end time, it’s hard not to feel a touch powerless. Good news! There are a lot of things that can be done to turn back the clock and pull the world back from the nuclear brink. Starting in the U.S., Congress has real power to limit the President’s absolute launch authority over the country’s nuclear arsenal, which would reduce the risk of an undemocratic jump to nuclear conflict. Additionally, sustained pressure from citizens and politicians alike can push the U.S. to the negotiating table with North Korea and other nations, a move that would prevent the world from stumbling into nuclear war through miscommunication or misunderstanding. Internationally, by supporting documents such as the Treaty on the Prohibition of Nuclear Weapons, nations (particularly nuclear-armed ones and their allies) can show support for a global consensus against nuclear war. Through all of this, Global Zero is fighting every day to ensure the clock never strikes midnight. We’re exerting our influence to bring political and military leaders on board with our program to reduce nuclear risk; the Nuclear Crisis Group is highlighting dangerous areas and forming an international consensus around steps to reduce risk; educational efforts are waking the general public up to the all-too-real risk of nuclear war. 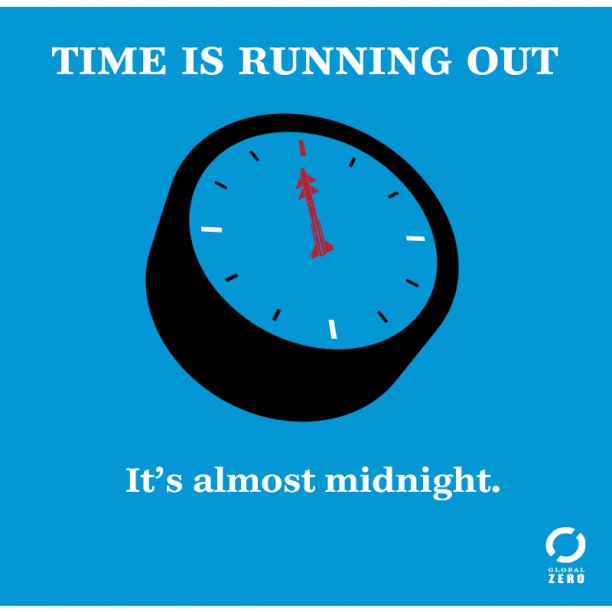 The world might be closer to midnight than it’s been in decades, but that doesn’t mean we can’t turn back the clock with your help.